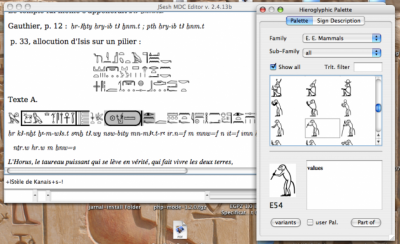 used in many professional egyptological publications: the IFAO, the JARCE, and all kinds of books. JSesh is opensource: its java code is freely available (under the CeCill license). For the user, it's definitly safer, as it means that, even if its present author was unable to work on it, other computer scientists might take on the development. Rosmorduc, Serge. (2014). JSesh Documentation. [online] Available at: http://jseshdoc.qenherkhopeshef.org [Accessed 12 Jun. 2014].